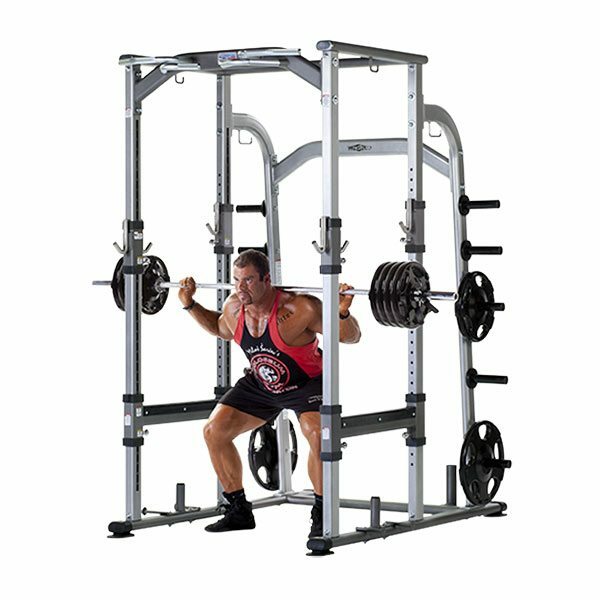 The TuffStuff Fitness Proformance Plus commercial strength series delivers a collection of equipment designed to exceed all expectations. Striking design elements, superior biomechanics and modern aesthetics blend seamlessly to create a line of resistance equipment that embodies an only-the-best-will-do philosophy with MADE IN THE USA quality. If your commercial facility requires high performance strength equipment that delivers professional results and exceeds your expectations, you’re ready for Proformance Plus! 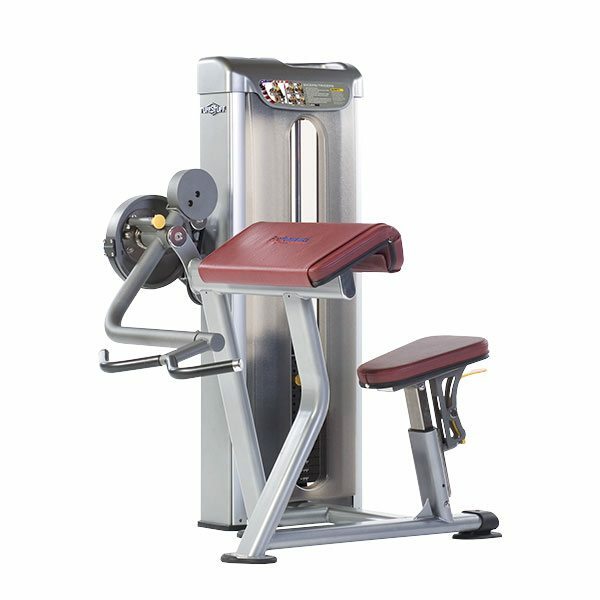 The TuffStuff PPMS-240 Single Cable Column is a selectorized functional trainer, designed for speed, functional, and ballistic training, and is accessible for wheelchairs, rehab equipment, stability balls, and workout benches. 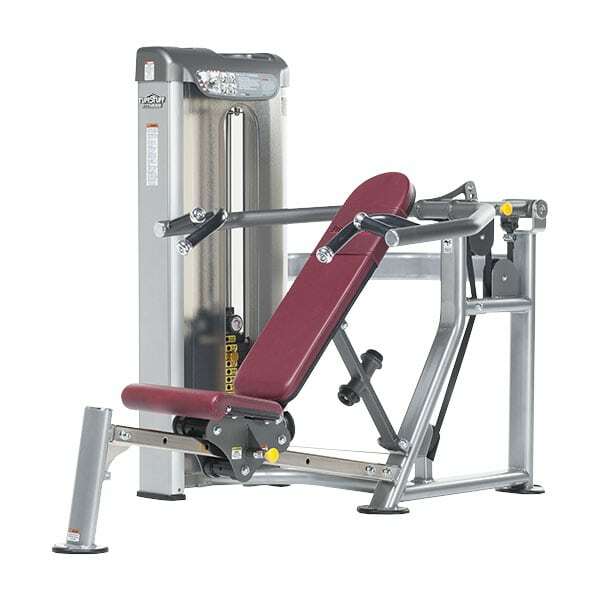 The TuffStuff PPMS-245 Functional Trainer is a selectorized functional trainer, designed for speed, functional, and ballistic training, and is accessible for wheelchairs, rehab equipment, stability balls, and workout benches. 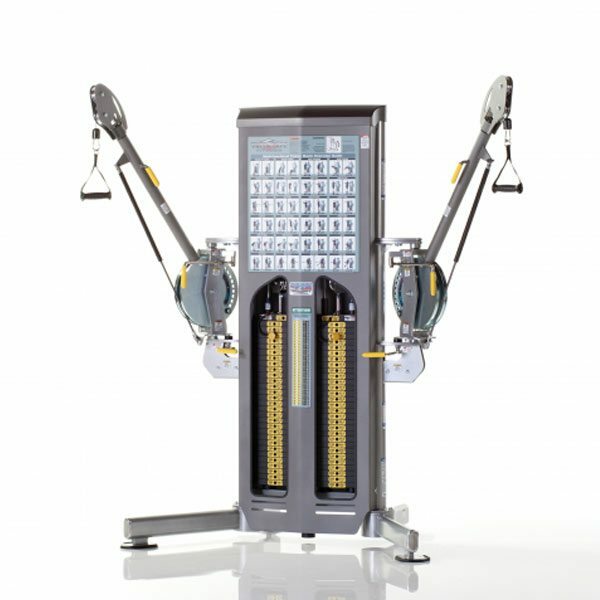 The TuffStuff PPMS-250 Adjustable Cable Crossover is a selectorized functional trainer, featuring dual 15 position pulley columns, which allow for single or dual exercise options. Swivel handles provide free and natural movement. And, the TuffStuff PPMS-250 Adjustable Cable Crossover also features full length protective weight shrouds. 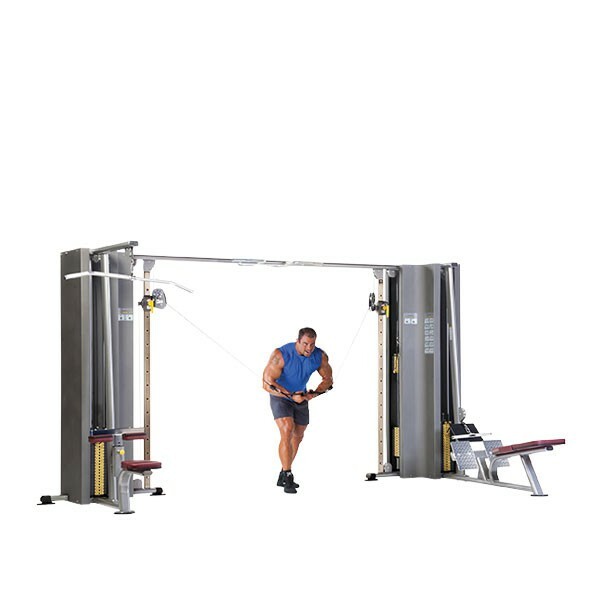 The TuffStuff PPMS-255 Dual Adjustable Pulley is a selectorized functional trainer, designed with a wide based frame for functional, speed and ballistic training. 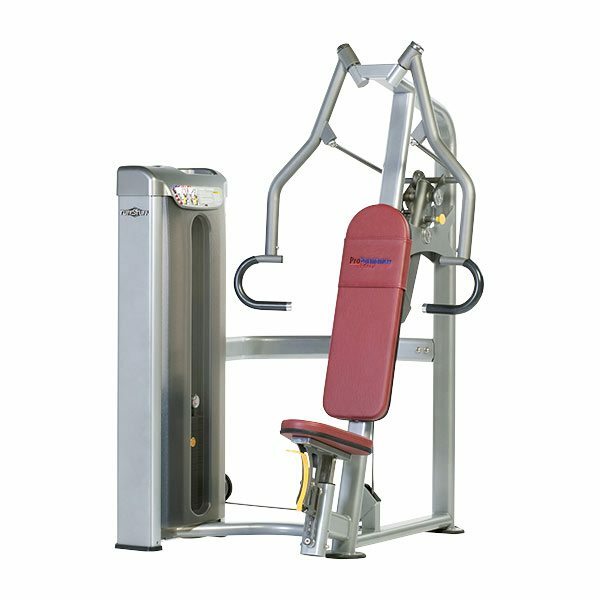 And, the TuffStuff PPMS-255 Dual Adjustable Pulley is also accessible for wheelchairs, rehab equipment, workout benches, and stability balls. 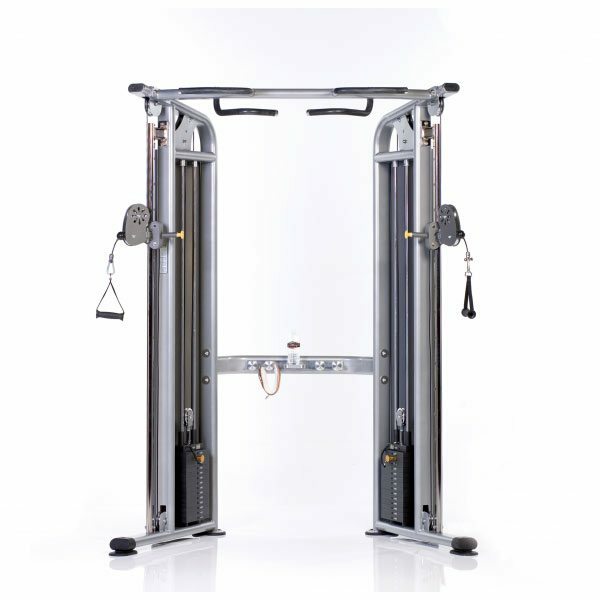 The compact side of the PPMS-255 uses less floor space than traditional cable crossovers, and the independent 15-position pulley columns allow for unilateral and bilateral exercise. 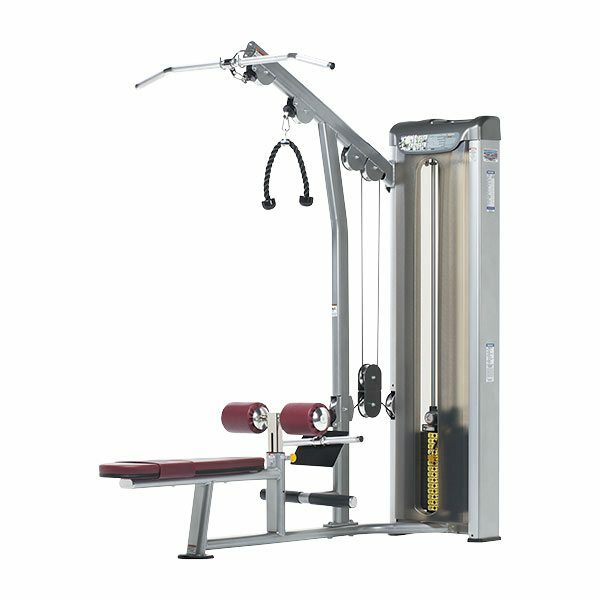 The PPMS-4000 4-Station Jungle Gym is a customizable, modular system, offering unmatched flexibility in allowing your customers to choose their exercise stations, while allowing you the flexibility for positioning to suit your facility. 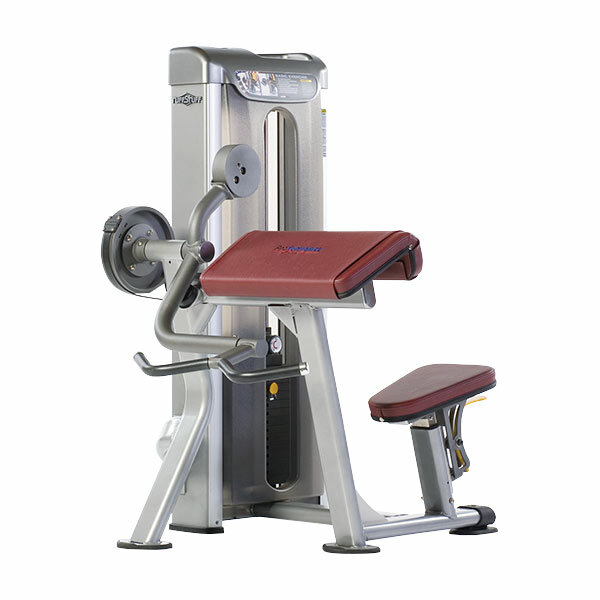 The PPMS-4000 comes standard with four (4) 200 lbs. steel weight stacks, and full length protective steel weight shrouds with integrated exercise placards. 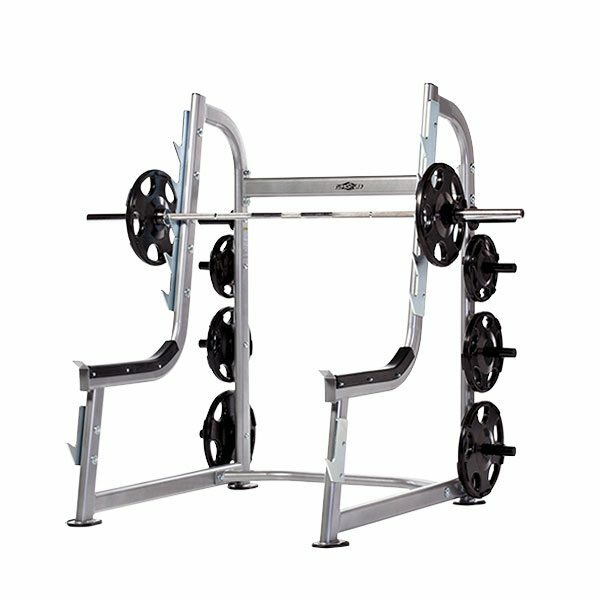 The Tuff Stuff PPF-752 2-Tier Saddle Dumbbell Rack is a sleek, full commercial-quality piece of weight equipment that is an ideal option for outfitting any weight room, rec center, apartment complex or home gym. 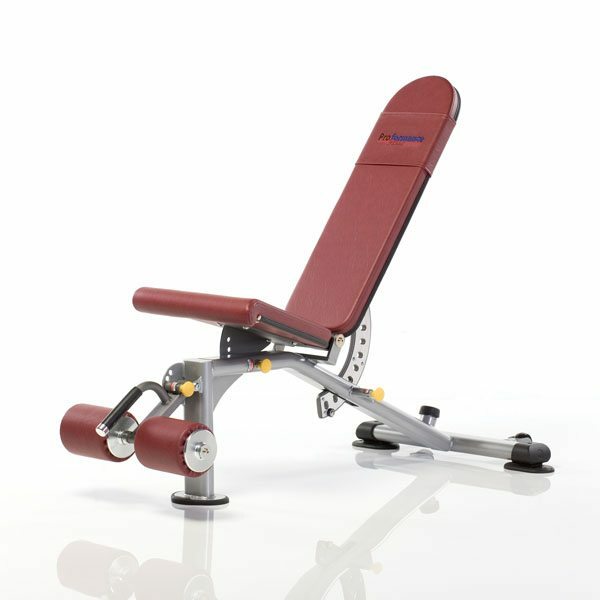 This rack is professional style with an individual rubber saddle. 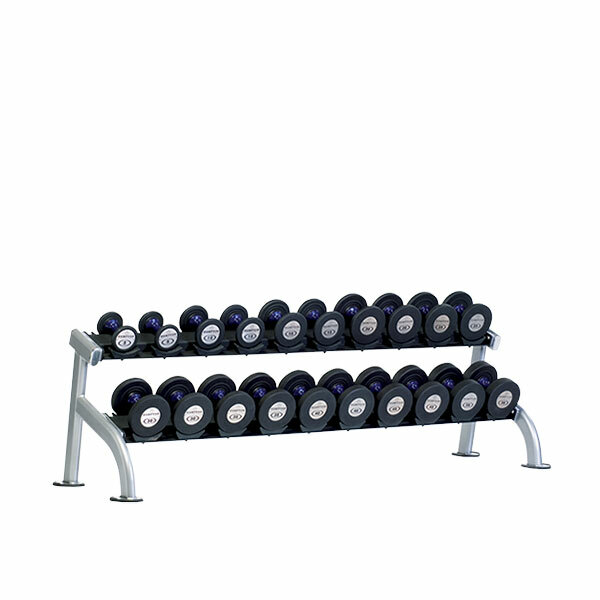 The two tiers hold 10 pairs of regular size dumbbells, and it fits any dumbbell grip size 4-1/4”. 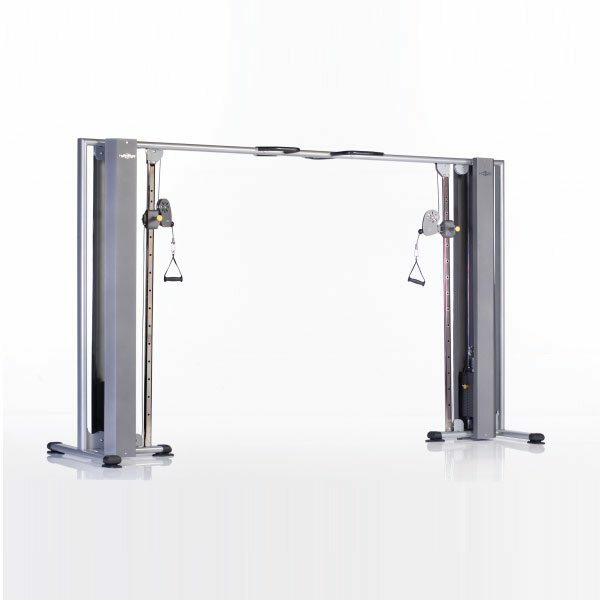 The PPMS-5000 5-Station Jungle Gym is a customizable, modular system, offering unmatched flexibility in allowing your customers to choose their exercise stations, while allowing you the flexibility for positioning to suit your facility. 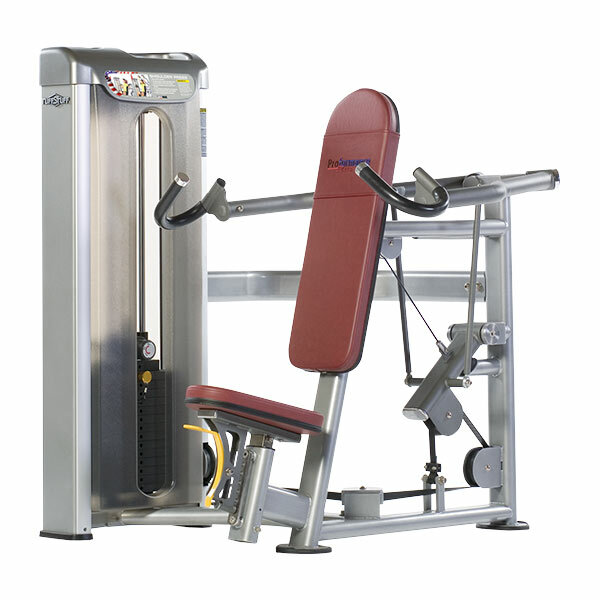 The PPMS-5000 comes standard with four (4) 200 lbs. 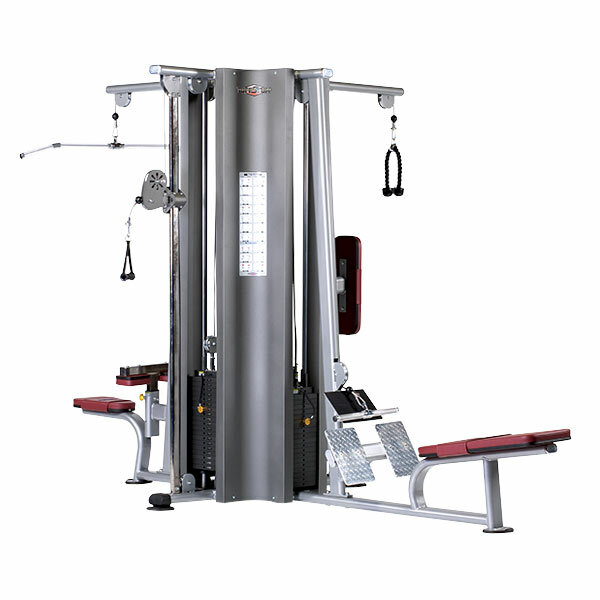 steel weight stacks, and full length protective steel weight shrouds with integrated exercise placards. 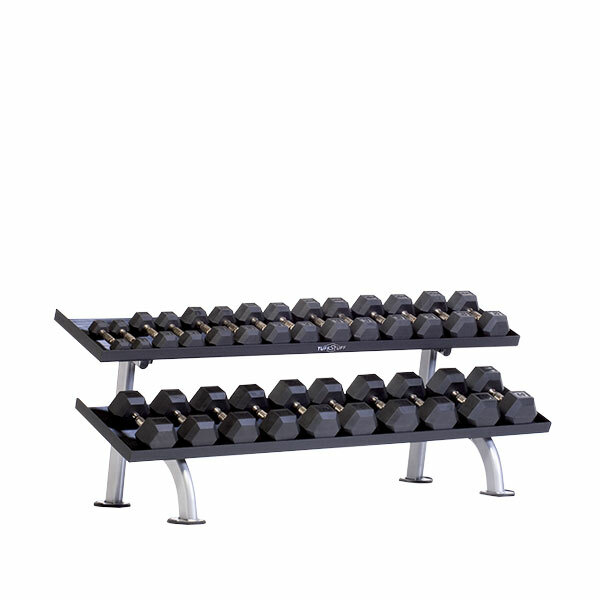 The Tuff Stuff 2-Tier Tray Dumb bell Rack offers the ideal place for storing both hex-type dumbbells and most regular-size dumbbells. Rubber padded trays provide a greater level of storage convenience. 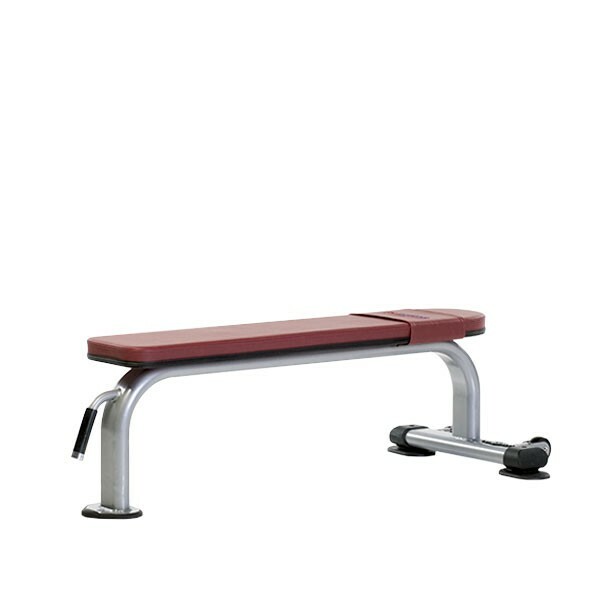 The TuffStuff PPF-702 Flat Bench is perfect for both dumbbell and barbell workouts. 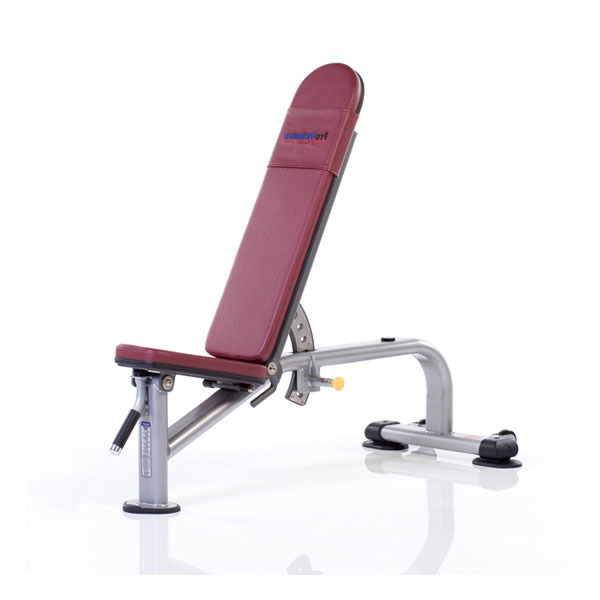 Use for dumbbell presses and rows or roll-away to a power rack or Smith machine for flat barbell bench presses. One-handed mobility is easy thanks to the built-in transport handle in the front and wheels in the back. 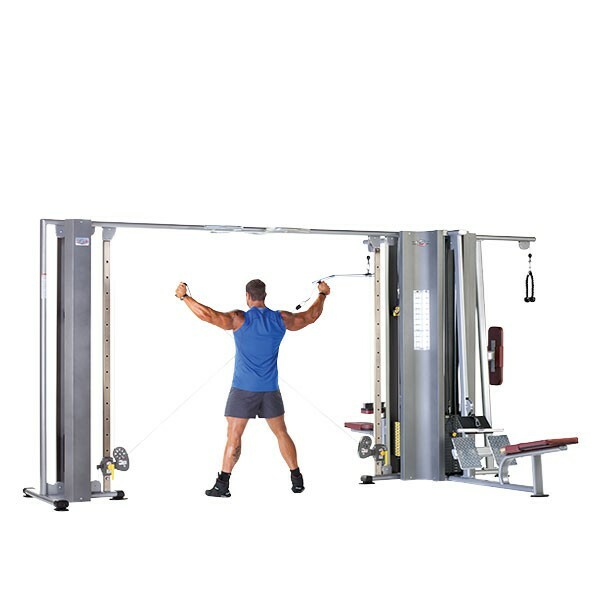 The PPMS-6000 6-Station Jungle Gym is a customizable, modular system, offering unmatched flexibility in allowing your customers to choose their exercise stations, while allowing you the flexibility for positioning to suit your facility. 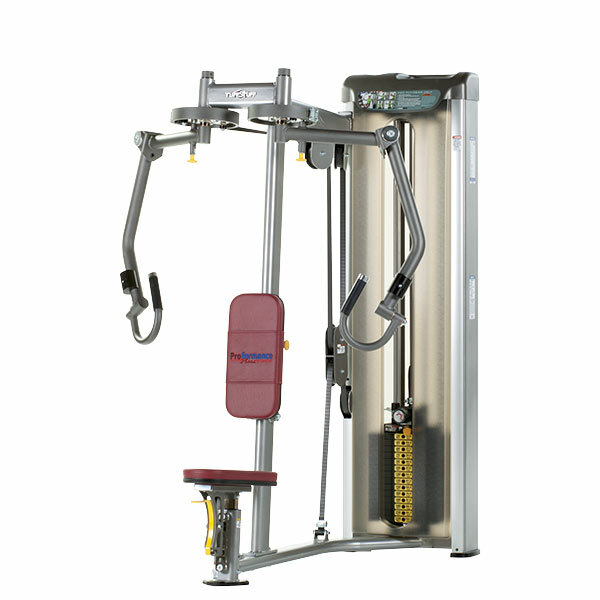 The PPMS-6000 comes standard with four (4) 200 lbs. steel weight stacks, and full length protective steel weight shrouds with integrated exercise placards. 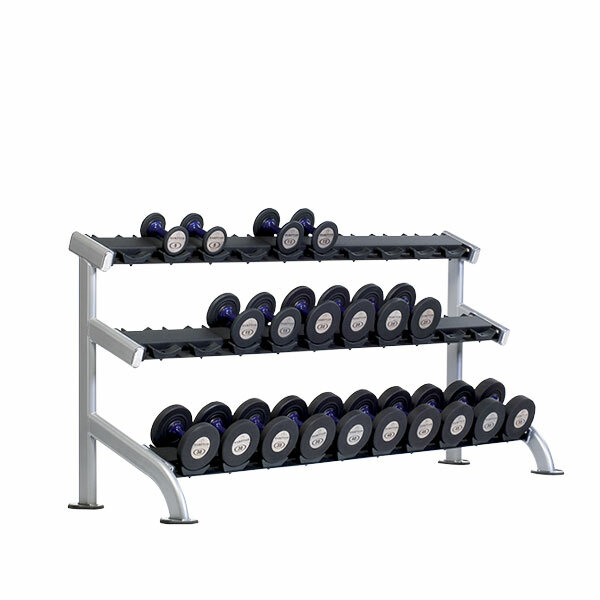 The Tuff Stuff PPF-754 3-Tier Saddle Dumbbell Rack can hold up to 15 pairs of regular sized dumbbells – great for facilities that need to maximize floor space. 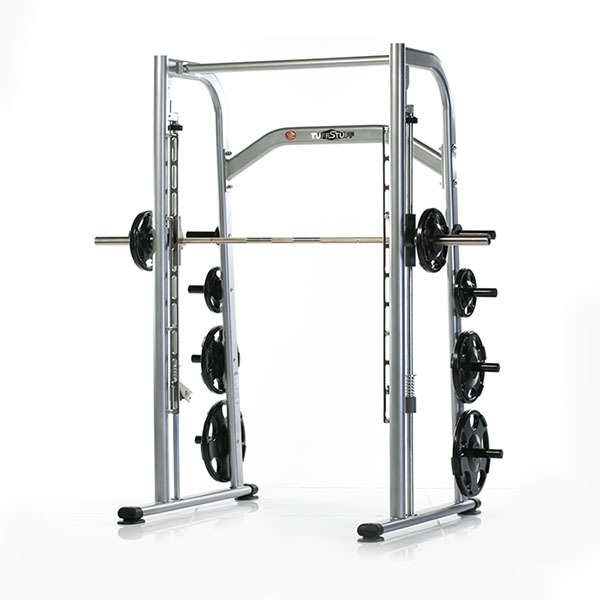 This commercial grade rack features an individual rubber saddle for easier use. 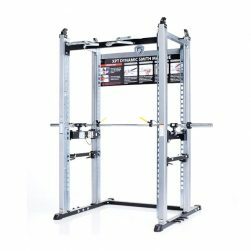 With the ability to fit any dumbbell grip size, this rack is great for facilities where multiple-sized equipment is used.